When it comes to film adaptations, the Dr. Seuss stories haven't been treated too well; whilst Horton Hears A Who was a fairly solid CGI flick, stinkers like The Cat in the Hat and The Grinch have left a horrible impact on audiences and critics alike. With the aforementioned Horton film boosting the future reputation of such adaptations, now comes The Lorax to hopefully excel that further - but it doesn't. The narrative is essentially (and badly) split into two halves, with one being the story of Ted Wiggins (Zac Efron) who lives in an extremely artificial metropolis named Thneedville under the watchful eyes of Aloysius O'Hare (Rob Riggle), a greedy businessman who has achieved world fame by selling bottled air. To impress his crush Audrey (Taylor Swift) by gifting her a real tree, Ted seeks out the Once-ler (Ed Helms), who tells him the story of how all the trees in the world were lost at his hands and of The Lorax (Danny DeVito), the charming if strict 'guardian of the forest' who attempted to stop him. 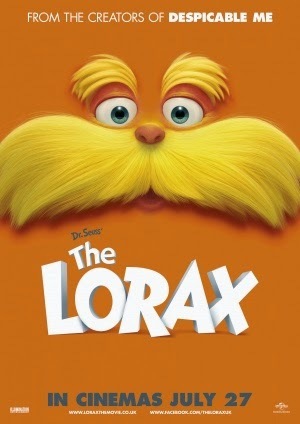 The Lorax's most impressive feature is the visuals, which are colourful, cutesy and most of the time match the visual style of Dr. Seuss (mostly with the lush, fluffy forests). Animation can sometimes appear stiff and jerky though it is generally fluent, and the landscapes are decently crafted. The film is viewable in 3D and the format is fairly decent albeit pointless, adding nothing to the experience of the film and even sometimes making the viewing rather unpleasant. The biggest problem is the storyline, which is converged in such a manner that it can be difficult to determine what story the film is actually trying to explore. I enjoyed the flashback storyline of The Once-ler and his eventual impact on the forest, but the present narrative of Ted Wiggins, Thneedville and the ungodly annoying O'Hare (which if I may say was not in the original book) feels shoehorned in to provide some more weight and increase the run time. In scenes where Ted reacts irritated to The Once-ler abruptly stopping the story and telling him to return tomorrow, his emotions pretty much mirror the annoyance of the audience as we now drift back into his own lifeless storyline. The Attic at LSFF 2013!